An award from the Prime Minister was lovely but this is the start to the year I really hoped for – a 9 year all clear colonoscopy! 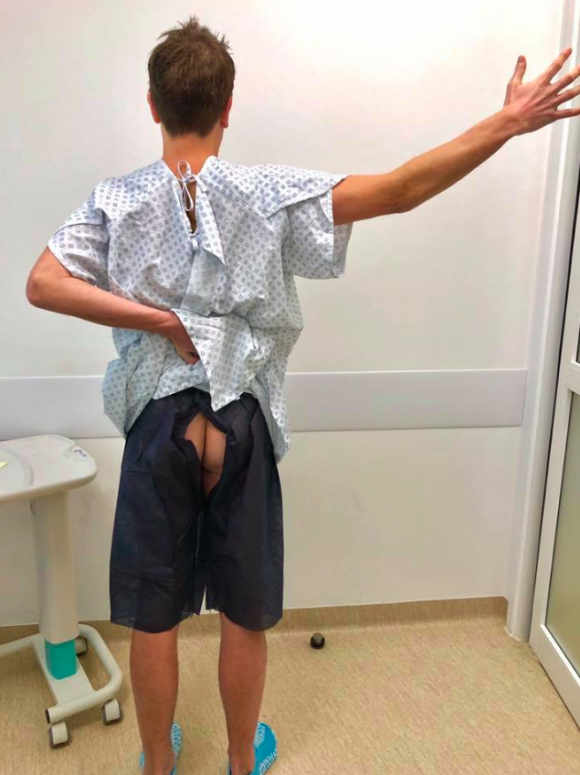 I was pretty confident all would be well but once the cannula goes in and you put on these fetching paper underpants – the sudden realisation of how quickly life can change kicks in again. Hearing…and seeing…that all was well was simply the best news I could ask for. I know bowel movements aren’t the most talked about topic but it’s nothing to be ashamed of or embarrassed about. Bowel cancer rates are on the rise so if you have any of the following issues please see a doctor as soon as possible. I was 30 when I was diagnosed and my only symptom was tiredness. I knew something wasn’t right and I kept going back to the doctor until further investigation led to a colonoscopy and the discovery of a 10cm tumour in my large bowel. That early diagnosis by the team at UCH not only helped save my life but also helped reduce further complications down the line. So please don’t mess around and don’t ever be embarrassed to talk about your bowel habits. It might just save your life! The good news about Bowel Cancer is there are things you can do to help prevent it. Doctors believe my bowel cancer was caused by the extensive radiotherapy I had as a child. This radiotherapy had damaged numerous parts of my body including my bowel but looking back I definitely didn’t look after myself in my 20’s. I let my job stress me out, I worked shifts, I ate fast food on the go at all times of the day and night so my body clock was all over the place, I binge drank, for 4 years I lived on one of the busiest roads in London, I didn’t exercise much and I spent the majority of my day sitting in London traffic going from crime scene to crime scene, seeing things that nobody should ever see. As someone who had experienced cancer before, I was already prone to getting it again but I am confident that if I had dealt with work related stress effectively, eaten the right diet, given up drinking sooner and exercised more, I wouldn’t be sitting here now with half of my bowel missing. If you have any type of pre-existing medical condition including cancer and need travel insurance then these guys are the people to see. 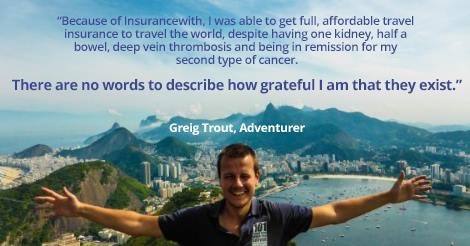 Because of insurancewith I was able to travel the world at an affordable price with all my ‘conditions’ covered! They deserve all the publicity and recognition they can get for enabling those with disabilities to travel at an affordable rate.